Try this Blue Peach Pizza Recipe for a truly amazing dish. Diced fresh peaches and blue cheese crumbles are only two of the surprising ingredients on this whole wheat tortilla peach pizza recipe. Spray both sides of tortilla with cooking spray and sprinkle with 1/4 tsp. kosher salt. Bake 4 min. on each side. Sauté diced sausage and onion over medium heat 7 to 8 min. or until sausage browns and onions are tender. Mix cream cheese with lemon juice, maple syrup and 1/2 tsp. salt. 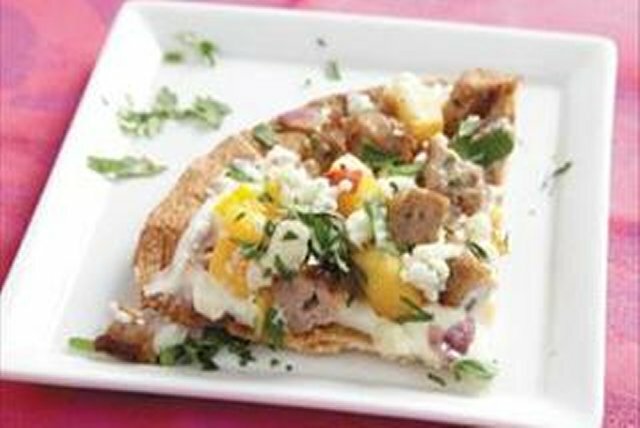 Spread cream cheese mixture on crispy tortilla shell, then sprinkle sausage mixture, diced peaches and blue cheese on top. Place assembled pizza back in oven for about 5 min.